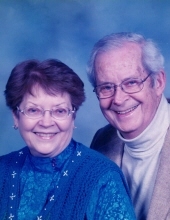 Janet Coleman, 85, of Wooster, died Wednesday, April 3, 2019 at her home, following a period of declining health. Janet was born Nov. 6, 1933 in Shreve to Thomas and Bessie (Alleman) Berry. She graduated from Shreve High School, class of 195l and from Kent State University with a Bachelor of Science in Elementary Education. On Aug. 13, 1955 she married Glenn Coleman, he preceded her in death on March 5, 2004. She worked at the former Wooster Rubber Company (Rubbermaid) as a secretary and taught in the Barberton City Schools and Wooster City Schools from 1966 to 1991. She was a remedial reading specialist at Walnut St. School, Lincoln Way Elementary and Parkview Elementary. She and Glenn owned and operated Green Room II Antiques in Wooster from 1989-2003. Janet was church organist at Shreve Christian Church, Central Christian Church and choir accompanist at Apple Creek United Methodist Church from 1993-2011. Reading, watching television and spending time with family and friends were some of the many enjoyments in her life. Surviving is her son Barry and several nieces and nephews. Preceding her in death were her parents, husband; brothers, Russell and Philip Berry and a sister Jean Luft. Family and friends may call Monday April 8th from 5:00 to 8:00 P.M. at Schlabach Funeral Home in Shreve. Funeral Services will be Tuesday, April 9th at the Shreve Christian Church at 10:00 A. M. with Pastor Wayne Enders officiating. Burial will be in Oak Grove Cemetery, Shreve. Charitable donations may be made to: Shreve Christian Church, Wayne County Humane Society, Wayne County Historical Society, American Cancer Society or the American Heart Association. The family wishes to thank the doctors and staff at the Cleveland Clinic Specialty Center, the nurses at Kindred at Home, Greg Barton and the Wayne County Hospice for the excellent care they provided for Janet during her illness. To send flowers or a remembrance gift to the family of Janet Coleman, please visit our Tribute Store. "Email Address" would like to share the life celebration of Janet Coleman. Click on the "link" to go to share a favorite memory or leave a condolence message for the family.